Savour and stock up on farm-to-table freshness. Rich soil, Canada’s longest growing season and farming knowledge that’s been honed over multiple generations create perfect conditions for growing some of the country’s best produce.Stock your trunk at farmer’s markets or enjoy a meal prepared by one of the many local chefs that work their magic with seasonal ingredients. What follows is blogger, Christina Bieniek&apos;s account of her trip to taste the region&apos;s farm-to-table flavours. Like most hard-working folk, I live for my vacation time, and being a total foodie, my vacations always revolve around food! I’ve been to Spain, Israel, France, Italy, UK, USA and more- all in search of the ultimate foodie adventure. But let’s be honest, I don’t always have time (or budget) to fly across the world and there’s so much here in Canada to see and eat. So with the warm weather finally upon us, I decided that a trip to Ontario’s Southwest would make an amazing weekend foodie getaway! So with my itinerary packed, I left my house hungry to explore the best of what Ontario’s Southwest has to offer. Early on the morning of Saturday June 6, my fiancé and I packed our car and left the hustle and bustle of Toronto to enjoy a peaceful food and fun filled weekend in Southwestern Ontario. 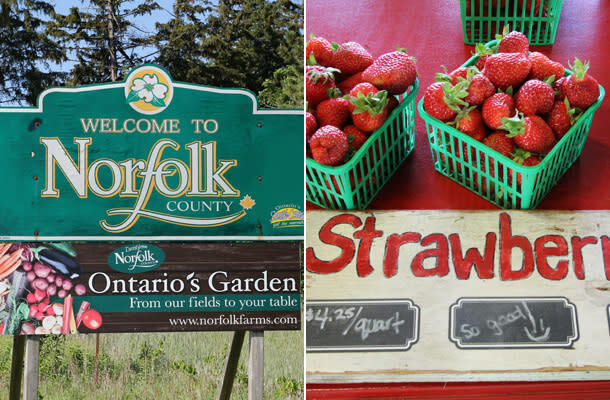 Our first stop on our weekend vacay was Norfolk County (also known as Ontario’s Garden). Wholesome Pickins farm market was on top of the day’s agenda. This farm and market is situated on a 112-acre property near Delhi, Ontario, and is run by David and Jennifer Van De Velde. Wholesome Pickins offers pick-it-yourself options for many of their fruits and veggies, making it the perfect family activity. The super yummy aroma of strawberries and rhubarb filled the farm market when we walked in, making it impossible not to buy a bunch. Wholesome Pickins farm market had a great variety of fresh local produce (most of it grown right in the back on the farm land), as well as delicious house baked goods, preserves and more. Wholesome Pickins made for the perfect kick off to our trip to get an immediate sense of what Ontario’s garden had to offer. It may have still been morning, but Ramblin’ Road Brewery Farm was our next destination (because anytime is beer time in my books). Ramblin’ Road Brewery Farm in La Salette, Ontario is the only brewery farm in Ontario. Owned and operated by John Picard and his family, Ramblin’ Road is an actual working farm with crops growing, a hop garden flourishing and plenty of activity. They grow their own hops on the Brewery Farm, draw pure spring water from their coveted and productive land, and use the finest Canadian barley & yeast to make some incredibly delicious beer. My favourite beer was the Ramblin’ Road’s famous Dakota Pale Ale made with Dakota Pearl potatoes. Speaking of potatoes, Ramblin Road also doubles as a Kettle Chip factory where the Picard Family makes some super yummy kettle chips. Beer + kettle chips = the ultimate match made in heaven. Matz Fruit Barn in Port Dover, Ontario is a third generation, and family owned and operated farm establishment that hand picks all of their fruits and vegetables every day. On our visit we saw a bounty of beautiful Ontario asparagus available in a self-serve manner (dietitians always love self-serve veggies). This lovely farmers market in Port Dover, Ontario is open every Saturday morning until 1 pm and is home to a bunch of incredible local farmers. From their local produce, to their in-house butcher and deli, to their bakery, cheese shop and more, there’s lots for us foodies to get excited about! At the Jensen Cheese booth, we got to learn about their third generation, family owned cheddar manufacturing business that’s located nearby in Odessa, Ontario. We even got to sample some of their delicious old cheddar (my favourite)! 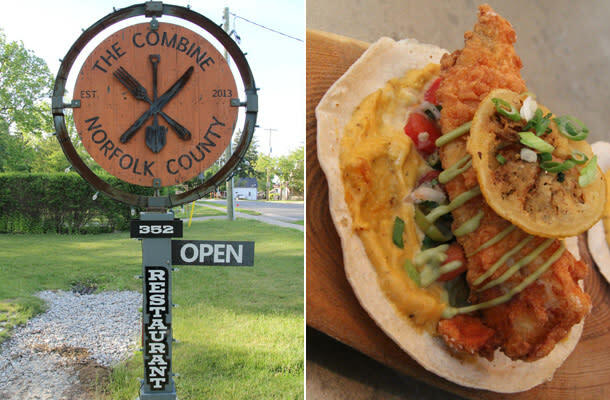 The Combine is a gem in the Heart of Simcoe, Ontario in Norfolk County. 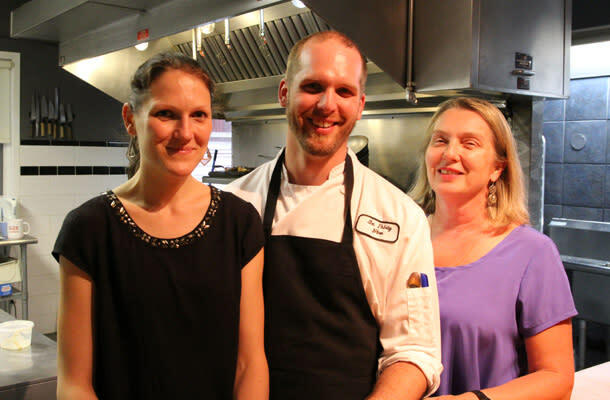 Owned and operated by Chef Ryan Rivard, The Combine uses the local Norfolk bounty (including crops from their own garden) to create delicious gourmet fare. They also have a handmade brick oven that continually pumps out the most delicious pizza. 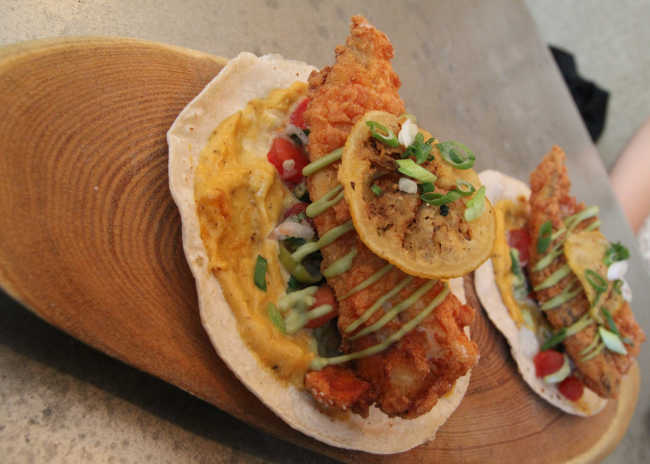 I credit The Combine for making the best fish taco I have probably ever had using local Lake Erie perch. Butternut Aioli, Grilled Corn Tortilla, Pickled Salsa, Guacamole Sour Cream — I can’t even explain how good these were! Delicious and beautiful. I recommend going to visit Chef Ryan and his team at The Combine the next time you are in Norfolk County. A great establishment with great values and beautiful food—not to mention the best tacos north of Mexico! The Normandale Century Inn is located in the heart of Norfolk County in Normandale, Ontario. The Inn was built in 1875 and originally named the Normandale General Store. In 1966, the current owners, Hans and Brenda, expanded this local general store to include an inn and restaurant. The Inn offers cozy accommodations, country dining, and gives guests four lovely rooms to choose from (we stayed in the Port Rowen room for $119.00 per night). All rooms have a private ensuite, satellite TV, high-speed wireless internet and air conditioning. A continental breakfast is also included with your stay. We had a lovely comfortable stay at the Normandale Century Inn and definitely enjoyed everything this quaint area had to offer. I would highly recommend the Normandale Century Inn for your stay during your very own Southwest Ontario foodie adventure. Day two brought more local foodie fun! Overseen by Tom Haskett (affectionately known as Uncle Tom), The Cider Keg is a 249-acre family run farm where apples are celebrated in all of their flavourful glory. The Cider Keg produces 10 different sparkling apple ciders that are sold all across Canada. We were given a royal Cider Keg welcome and were able to sample a variety of refreshing flavours with my favourite being the Apple Peach flavour. If you’re a cider lover (and who isn’t right now- it’sthe summer drink), you have to give The Cider Keg a visit. They also have a variety of delish jams, jellies, salsas, cider vinegars and more to explore. Thanks to the Haskett family for such a warm welcome and a sweet (pun intended) morning. SixThirtyNine Restaurant in Woodstock (our only stop in Oxford County) was my favourite part of my weekend foodie adventure in Ontario’s Southwest. You have to put SixThirtyNine on your bucket list of restaurants to visit. The service was impeccable, the food was delicious, and the atmosphere was comfortable and enjoyable. Chef Eric Boyar is a culinary rock star that makes this restaurant such a gem. His menu is elegant, yet approachable, and beautifully presented, paying the ultimate respect to the area’s local products and suppliers. Thank you to Chef Eric, his wife Jen, and his mother for welcoming us into their restaurant. We truly loved every minute (and bite)! I would highly recommend this restaurant to any food lover, it is truly worth the trip alone. For groups of four, I would also suggest booking their intimate chef’s table option (the ultimate foodie experience). I had such a great time on my local foodie escape to Ontario’s Southwest. Find mouthwatering inspiration following the hashtags #OSWdigin and #OSWpouraway on Twitter, Facebook and Instagram. Christina Bieniek is a Registered Dietitian and project assistant at Abbey&apos;s Kitchen Inc. Abbey&apos;s Kitchen is an international food and nutrition media outlet lead by Registered Dietitian and food expert Abbey Sharp. Follow Christina and Abbey&apos;s Kitchen on their foodie adventures in Ontario and across the world atabbeyskitchen.com.